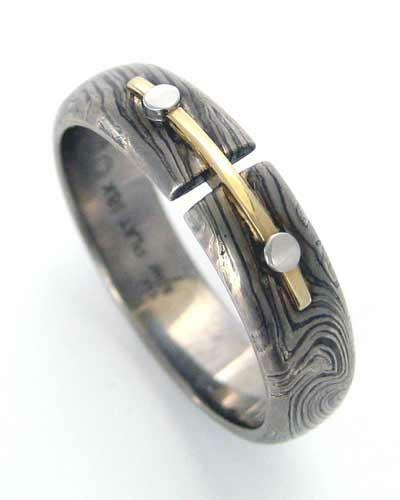 Understated elegance of Mokume in its most elemental form. 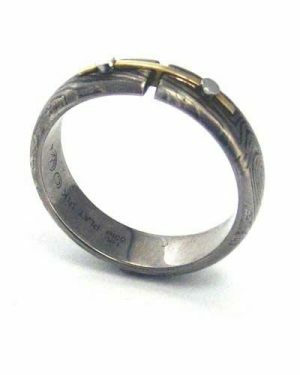 This 6mm wide mokume ring features a band of white and gray gold with sterling silver enhanced with a bar of 18k gold and platinum rivets. Size 10 1/2. George Sawyer is one of the great innovators of mokume working in America today. An early practitioner of this ancient art, George was instrumental in the revival of this neglected practice and one of its most creative practitioners. His work is highly regarded and widely collected. His work is subtle, depending more on texture than color to achieve his gentle magic.